Playing the music of The Beatles, Chicago, and More! 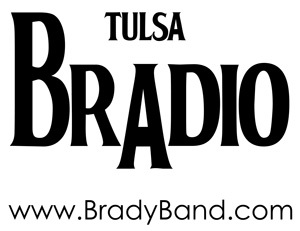 Want your very own Tulsa Bradio T-shirt? You can download this zipped TIFF file and print to an ink jet iron-on transfer sheet, available from your favorite office supply store. 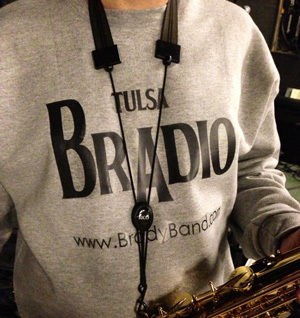 We do plan on making professionally-made Bradio shirts and other merch available at some point, but for the do-it-yourselfer, this can be fun and yield pretty good results. Important! You're on your own, and if you destroy a shirt, cause an injury, or otherwise have a bad experience with this, we are very sorry, but not reponsible :-) This free iron-on logo is designed for light colored fabric only! TRIM as much of the excess paper away from the logo as you can. In spite of your transfer instructions saying crank the iron all the way up, this can really ruin your day, so take one of the trimmings and iron onto a rag or some other bit of fabric as a test. If there is the slightest hint of scorching, turn down the heat or you'll ruin the transfer and your shirt.